I have recently found another image of an early Norton in an album of early vehicle pictures from the state of Victoria, Australia. 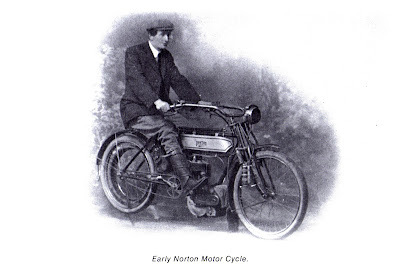 I think this is one of the first Norton-engined 3 1/2 HP machines from circa 1908 but as ever, I stand to be corrected by others more knowledgeable than me! I suspect the background is a painted country scene rather than an actual outdoors view.